The Rajya Sabha was on Wednesday adjourned for the day after Opposition MPs created ruckus over BJP president Amit Shah's remarks made in the House on Tuesday regarding the National Register of Citizens (NRC) in Assam. Parliament Live updates: The Rajya Sabha was on Wednesday adjourned for the day after Opposition MPs created ruckus over BJP president Amit Shah’s remarks made in the House on Tuesday regarding the National Register of Citizens (NRC) in Assam. As soon as the House met at 11am, Congress MPs stood up to register their protest against Shah’s remarks. Congress MP Anand Sharma asked Chairman Venkaiah Naidu to expunge the BJP leader’s comments wherein he said “you did not have the courage, but we have it to implement the NRC”. Naidu said that he would look into it and would expunge any remarks that were found uncalled for. The Chairman said that since Shah was not allowed to complete his speech yesterday, he should be given a chance to resume his speech on the issue. The opposition members objected to it, forcing Naidu to adjourn the House till noon. The House met at 12 and it was adjourned till 2 pm after taking up 12 questions during question hour. The Chairman said that the issue of NRC will be discussed post-adjournment. When the House met again to discuss the NRC issue, opposition MPs created ruckus, forcing the Chairman to adjourned the House for the day. Amid barrage of criticism over her 'civil war' remark, Mamata Banerjee today said that not all immigrants are infiltrators. She said, "We don't want a civil war ot bloodbath." The CM reiterated that BJP was doing politics over the NRC issue, saying, "It is very unfortunate. This is wrong. This is an inhuman act." Adhir Ranjan Chowdhury of the Congress said the NRC has created an atmosphere of uncertainty. He said different kind of statements are being made on the NRC issue. While BJP president Amit Shah said the government had the courage to execute the NRC, Assam Chief Minister Tarun Gogoi claimed the NRC was his baby, Chowdhury pointed out. "Attempts to polarise people is being made," he charged. Arpita Ghosh of the TMC in Lok Sabha referred to George Orwell's novel "1984" to snipe at the government, accusing it of carrying out surveillance of citizens through Aadhaar and now using the NRC to force people out of their lands. "It should be stopped," she said. "1984" is a dystopian novel set in the year 1984 when most of the world population has become victim of war and government surveillance. Rajya Sabha adjourned for the day amid uproar by TMC members over the Assam NRC. BJP MP Rupa Gangulay slammed Mamata Banerjee over her 'civil war' remark. She said the BJP workers are killed in the Trinamool Congress-ruled states every other day. The Congress in Tripura has alleged that the BJP-led governments at the Centre and in Assam were involved in a "pre-planned conspiracy" to exclude 40 lakh people in the state from the draft National Register of Citizens (NRC). "Genuine citizens with valid documents have been excluded only to drive them out of Assam. It's a pre-planned conspiracy of the Centre and Assam government. Those whose names do not figure in the draft NRC are mostly Bengali Muslims, Bengali Hindus and Manipuris," Tripura Pradesh Congress chief Birajit Sinha said. Trinamool Congress supremo Mamata Banerjee who is on a three-day Delhi visit, met veteran BJP leader LK Advani in the Parliament. It is expected that she discussed the issue of NRC with the BJP leader. The meeting took place a day after Mamata met Home Minister Rajnath Singh at latter's residence. BJP president will visit West bengal on August 11. It is expected that he will address a rally to dispel the apprehensions over the NRC issue. Union Home Minister Rajnath Singh will make a statement in the Rajya Sabha at 2 pm on the Assam NRC issue. Meanwhile, the Rajya Sabha has resumed the debate on the matter. MoS for Home Affairs Kiren Rijiju said that Mamata Banerjee is trying to incite violence by making remarks like 'civil war'. He said that her remark is condemnable. The Congress party has opposed Mamata Banerjee's 'civil war' remark in the wake of the release of NRC draft in Assam. Rajya Sabha adjourned till 12 noon after opposition parties create uproar over the NRC issue. BJP president Amit Shah who also is a Rajya Sabha MP, is likely to speak again on the floor of the House over the NRC issue, tv reports said. As soon as the Rajya Sabha met at 11 am to transact business, the opposition MPs once again stormed to the Well of the House and created ruckus. Chairman Vankaiah Naidu expressed his anguish over the opposition parties behavious on the floor of the House and urged them to go back to their desk. The Congress party has given an adjournment notice in the Lok Sabha over the release of the final draft of NRC. The notive was submitted by party MP Adhir Ranjan Chowdhury. Over 40 lakh of the 3.29 crore applicants were excluded from Assam's draft National Register of Citizens (NRC) released on Monday, sparking concerns about their future and triggering a nationwide political row. Applications of 2.89 crore were approved in the draft list of citizens, which forms part of a long-running campaign against Bangladeshi immigrants in Assam. 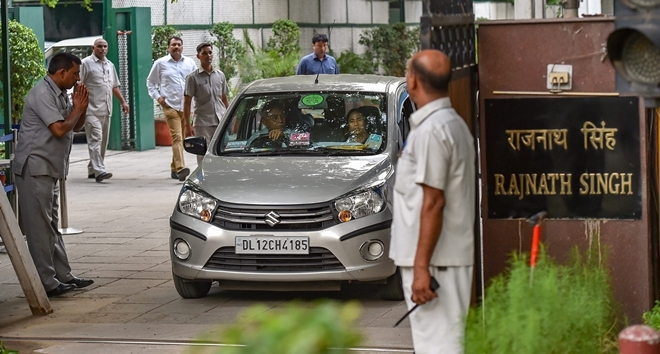 Trinamool Congress chief Mamata Banerjee met Home Minister Rajnath Singh in Delhi on Tuesday to discuss the Assam situation in the wake of the release of NRC draft. News agency IANS reported that Singh assured Banerjee that nobody will be harassed in the updation process of the list and that it was published in line with the provisions of Assam Accord. The Rajya Sabha on Tuesday saw repeated disruptions over the Assam NRC issue. The House was adjourned for the day at 1:15 pm after opposition objected to BJP president Amit Shah's remarks that the opposition was trying to protect Bangladeshi infiltrators. Shah had said: "The Assam Accord was signed by your Prime Minister Rajiv Gandhi on August 14, 1985. And he announced it from the Red Fort in his speech the next day. The spirit of the Accord was the NRC that would help identify the Bangladeshi infiltrators. You did not have the courage to implement it. We had the courage and we are doing it. Everybody here (in the opposition) is concerned with the 40 lakh people. How many Bangladeshi infiltrators are there among these 40 lakh? Who do you want to protect? You want to protect the Bangladeshi infiltrators?" The much-awaited second and final draft of the National Register of Citizens (NRC) in Assam was published on Monday with 2.90 crore names out of 3.29 crore population. The matter has taken a political turn with opposition accusing the BJP government of indulging in 'vote-bank' politics. However, the government has argued that the whole process was carried out under the supervision of the Supreme Court and that it has no say in it.